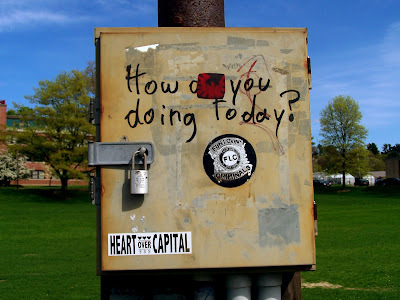 Miss Lonelyhearts Pays a Visit: How Are You Doing Today? Today, I ate ice cream in the rain. It wasn't nearly as bad of an idea as I thought it would be. Since my iPod isn't it tip top condition, I have been using a cheap voice recorder/mp3 player to listen to music when I am out and about. In order to get that powered up and running, I had to go to CVS to get one AAA battery. I ended up buying 20. It was the most logical purchase (considering the sale and the savings you get when you buy in bulk). Only 20 cents more to upgrade to the large cup of coffee. If you go with the combo it'll be 80 cents cheaper, and you get a free bag of potato chips. I can't help but wonder if this is strictly an American problem. Great cat themed game right here.